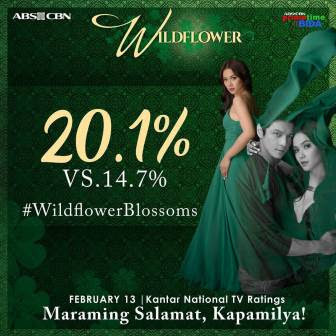 ABS-CBN’s newest primetime drama “Wildflower” is off to a good start as its pilot telecast instantly captivated viewers nationwide, garnering a national TV rating of 20.1% versus its rival program’s 14.7%, according to data from Kantar Media. The show, led by versatile actress Maja Salvador, also created buzz online as its official hashtag #WildflowerBlossoms landed on the top trending topics on Twitter last Monday (Feb 13). In its premiere offering, “Wildflower” introduced to viewers the young and energetic Lily (Xyriel Manabat) and showed how she and her parents Camia (Sunshine Cruz) and Dante (Christian Vasquez) are starting a new life in Poblacion Ardiente, a town ruled and governed by the powerful Ardiente clan. Lily then found a new friend in Diego, who happens to be the son of Ardiente mayor Emilia (Aiko Melendez) and grandson of patriarch Julio (Tirso Cruz III). What awaits Lily and her family in this new town?